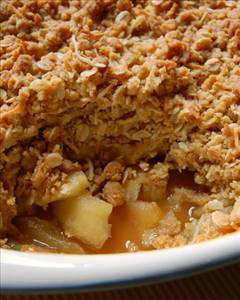 Delicious sweet baked apple crisp. Place in small 6x6" baking dish. Mix oatmeal, margarine, brown sugar and cinnamon together. Top the apples with this mixture. Bake at 425 °F (220 °C) for approximately 30 minutes or until topping is nicely browned. Serve alone or with ice cream. Note: add slivered almonds, raisins or walnuts for added flavor. 422 members have added this recipe to their cookbook. This recipe was okay. Not how I remember it as a kid but it was nice. What's "1" Serving? How do you determine the serving size? I have 3 small children that have been following a very strict low sodium diet with my husband and myself and I made this for them one night and they loved it. they thought we were cheating on our diet. This is delicious! I think that I might add some chopped pecans or walnuts to the topping the next time that I make it! Really tasty and easy to make. An old fashioned naturally sweetened cookie. There are 263 calories in 1 serving of Apple Crisp. Calorie break-down: 13% fat, 80% carbs, 7% protein.